The eighth in the series and maybe my favourite in the McKinsey & Company 12 disruptive technologies – 3D Printing. I have posted about 3D printing a couple of times over the last 6 months. 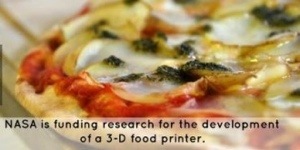 It has the potential to change many things – design, reduce waste, allow home fixing, and now maybe even pizza. But what about the property industry? This one is fairly obvious. 3D printing can help architects and engineers to rapidly prototype scale models of buildings and details at each design stage. The technology has already been adopted by architectural firms such as Hassell in Sydney. The next evolution 3D printing in design will be printing on a much larger scale. Imagine being able to produce 1:1 scale models of facade details, door handles, chairs, desks. Love it. Now, without going as far as predicting that we will have a giant humongous 3D printer that would print the whole building in one go, although that would be awesome, I can imagine more onsite creation of parts becoming prominent over the next 20 years. With the advent of 3D CAD and BIM more and more of our buildings all our buildings are designed and documented in 3D. So its not too far a stretch of the imagination to think about 3D printing becoming more prevalent in the construction of buildings. It may see a much greater reduction in the transport miles of many of our building products before they reach site. Rather than the raw material being shipped to one country, made in another and then shipped to another country where the building it being constructed we may see portable 3D printing warehouses that fit into shipping containers being moved to a construction site. That way only the raw material is being transported. It may also give us less construction waste on site. If the parts of the building can be manufactured on site specific to the site requirements we may see less need to reorder parts or less need to tweak the part before it will fit. Now this would allow another level of uniqueness to buildings. At the moment we tend to go for standard off the shelf solutions for cost of construction but also for the continued maintenance and operation of the building. I can imagine Gehry’ness or Starck’ness creeping into even the most frugal of buildings in the future, now that would make an alternative future!